I Forgot to say I Love You! 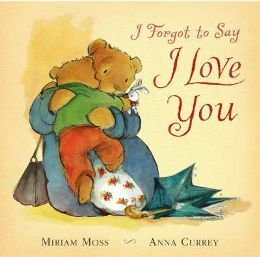 You can tell just by looking at the cover of this book – ‘I Forgot to say I Love You!’ – , where you see a mummy bear and her little boy having a BIG cuddle, that this is going to be a lovely warm story! And it is! ‘I forgot to say I love you’ really is a good book for sharing with little children! Many parents of young children will probably recognise a lot of the things that happen in this story! At the beginning the little bear called Billy is very slow at doing all the things he has to do in the morning such as getting dressed and eating his breakfast!